everything LEB: I See You! In the middle of all my Halloween decorating I decided to go and get a new mirror for my mantle. Well, actually I was at the Salvation Army and it was a deal too good to pass up, the mirror had to come home with me. The mirror measures 53" x 33"- just to give you an idea of the area over my mantle. ***Also- this is not decorated at all yet- I just stuck it up there last night. I need to place items on the mantle and possibly sconces on either side of the mirror to draw the eye out, not just up. And here is the before mirror. Do you think its better / worse / no different?? Give it to me, should I keep the new mirror or go back to the old one?? I like the shape and style of the old one better with your decor & fireplace mantle. But see how you could think something bigger might be needed. maybe if you hung sconces on either side of the mirror it would help? Both mirrors look really nice. I am drawn to the larger mirror because you have a lot of height in the room. You may need some other mantel objects to decorate with that are taller. What do you think? Does the mirror look good turned horizontally? Great find, I often shop there too for hidden treasures. Love the bats and thanks for your wonderful comments on my blog. I think the bats are a great decoration. Looks good on your fireplace. It looks too tall without anything next to it, but I think sconces or something else to balance it out (like you mention above) will solve that. Oh, I love the larger mirror, it really draws your eye to the height of the space and adds drama. Though I liked the round one, in comparison it looks just too small to be used here. 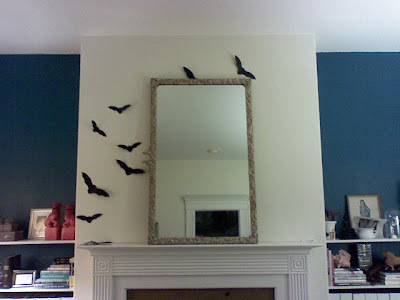 Hey, I actually like the bats flying around the mirror! I LOVE it! I definitely vote for the bigger one. Great find! it's not a fair competition because right now I have a mad crush on round and convex mirrors! Having said that, I think a large mirror on the mantle is a great way to increase the light and feeling of space in your room! Both are great! i think the round one draws your eye out and up where the big rectangle seems too narrow to really do more than draw the eye up. i vote for the old one, but i would like to see the new one with sconces to really know for sure. I'm all about huge mirrors, I like the scale of this one, but like MFAMB suggested, maybe something on the sides to balance the height. I agree with a previous comment about large + round. I'm also on the lookout for a round something (mirror, probably) to break up the harsh angles in our living room. The bats are super cute! Wow love the large mirror- great find! What a great find; I'm inspired to head to my local salvation army and dig around. I agree with a lot of the comments above, the heighth of the larger mirror really brings drama to the space and I think it would be great balanced out with sconces- you have so many fun options to play with! I like the bigger mirror. 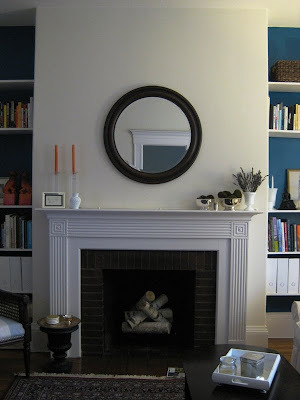 Round over a fireplace is always great, but I think the scale of the square mirror is better for the space. I like your bats too. I like the round one, but it maybe seems too small. Maybe you could paint the larger one black? I like the black of the round mirror and I'm sure that adding sconces around the larger one will help. Good luck! Bigger is better in this case! I like the height it brings to the room. Can't wait to see it accessorized! WOW, what a statement. I need hit up our Salvation Army! The rectangular one is tall and helps fill up an otherwise large space. The round one on the other hand softens the angles from the mantle and the built-in shelves. I really like the size of the big mirror! I like both mirrors.. since you got the new one at a deal you should definitely keep it and then if you get bored switch back to your old one! I say go with the bigger mirror! It really adds a lot to the mantle. I cannot believe you found it at Salvation Army! love the height and shape. LOVE. fantastic find! Not to add more anguish to this decision- but how about the long mirror sideways? BTW- love the blue walls! Of the two, I prefer the round one. But I think an even bigger rectangle one with a bolder frame might work too. I love the beach wood over the heat radiator. What a brilliant idea! It's just fab, turn a ugly problem into a functional piece. P.S. I love your post on the Chanel tray, I was eyeing the one Nikki Hilton created as a table. Maybe you can try it with white on black as well, if you found a black tray that is! I think I am going to try it myself sometime. Have you created LV or Versace ones?